We all know that announcing bad news is tougher compared to announcing a good one, especially when it comes to the passing of someone you dearly love. However, no matter how tough it is, informing the relatives and friends of the deceased regarding the details of the funeral is one of the first things that you must do. We know how difficult it is to post a notice and even to create one during these hard times. 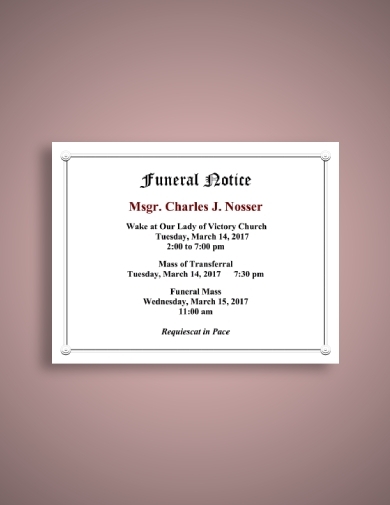 Hence, we provide you these useful funeral notice templates and examples that will surely help you extend the message to the concerned people. 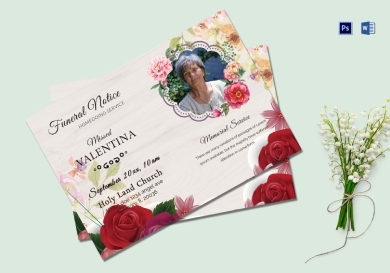 With this basic funeral notice template, it would be easy for you to inform the families and colleagues of the departed loved one for you only need to input the necessary details on the space provided. Similar to other notices, this notice contains the following relevant information to the recipients: name of the deceased, age of death, cause of death, date and location of birth and death, parents’ names, marriage information, personal achievements, surviving family members, funeral service details, and charity donation information. A wide space is also provided for the notice of death statement. Why settle for mediocre designs when you can have the best? Using this premium funeral notice, it would be easy for you to immediately notify the intended recipients because this funeral notice template is easy to edit and personalize according to your own preferences. This is available in different file formats—MS Word and Photoshop—making it convenient for the users. Hence, you can edit the texts and designs and customize it until you get satisfied with the outcome. 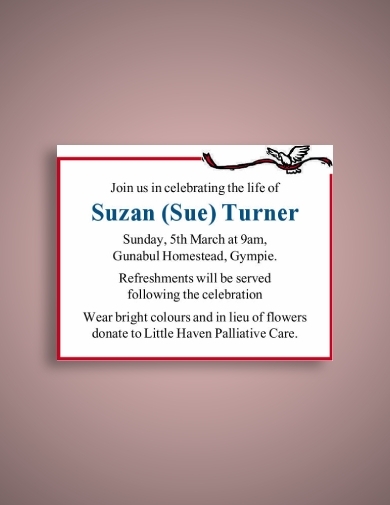 Getting overwhelmed in designing a funeral notice? 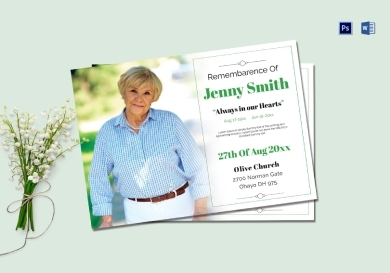 With this funeral death notice, you do not need to start from scratch as there are already designs and graphics available. All you need to do is replace the text with the pertinent information regarding the funeral notice of the deceased. This is easily customizable, hence you can send the notice right away to the intended recipients. You may send them an online or digital copy or you may opt for the tangible traditional one. 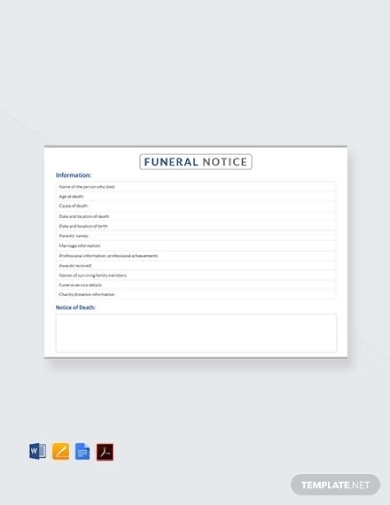 In this last moment with your mother, or even the one whom you treat as a mother, honor her by creating an elegant funeral notice, such as the notice template presented above. Created by professional designers and graphic artists, this template has high-quality graphics, making your notice look sophisticated and presentable. This is easily downloadable and customizable with the use of computer applications or programs that support MS Word and Photoshop file formats. A homegoing service, or the funeral traditional marking the going home of the deceased to heaven, has become a typical part of the African American history and culture. In order to invite the important persons of the departed one, this homegoing funeral death notice can surely help. 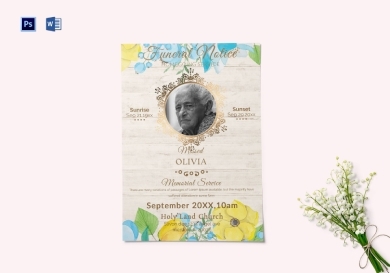 With just a few clicks in a few minutes, you can already achieve something that is elegant and worth keeping as a keepsake for the funeral. 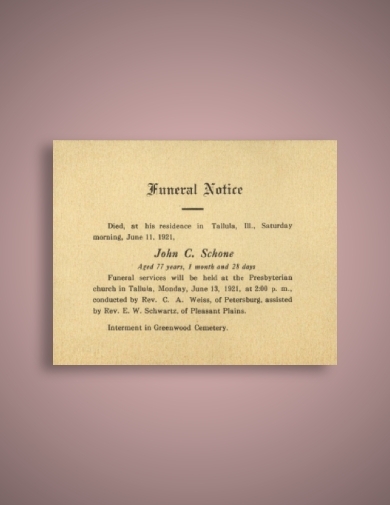 This vintage funeral notice is a living proof that funeral notices started from a very long time ago and that people, even from before, typically wanted to notify the family and friends of the deceased. Indeed, notices really played a vital role in informing people regarding the updates and details of the funeral. Apart from funeral announcements and funeral invitations, a funeral notice can help extend the information of the funeral program and service to the relatives of the person who have just departed. 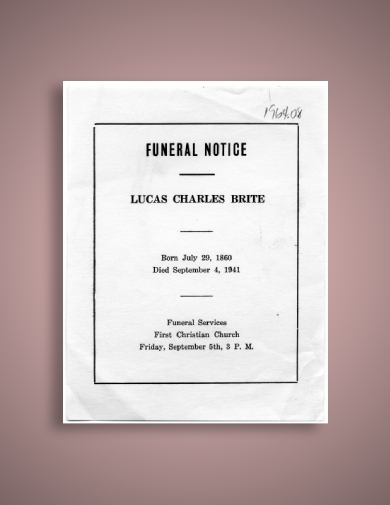 Just like this simple funeral notice, no matter how simple or minimalist your notice is, the most important thing is that it contains the necessary information that the recipients must know, such as the name of the deceased and place, date, and time of the funeral as wake, transferal, and mass. Some notices would also include the officiating pastor or priest. This is an example of a very basic but still informative funeral notice. Similar to the previous example, it contains the name of the deceased and the details as regards the funeral. Also included are the information regarding snacks or refreshments, the appropriate attire color, as well as the information relating to the possible donations. The document is highlighted with bright red border, making it striking and appealing to the readers. 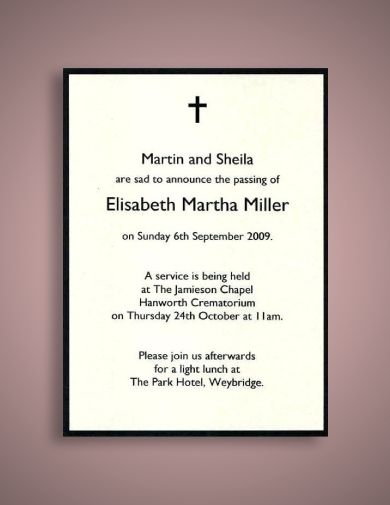 A simple yet elegant funeral notice, this is an example of a very minimalist design that you may also refer to when you want to make a straightforward notice. Just do not forget the vital information about the funeral details, including the main heading, which can be “Funeral Notice” alone or any other similar words; the name of the deceased; date of birth and death; place, date, and time of the funeral service; and the officiating priest of pastor. With thick black borders complementing the pure-text content, this design is typically used when you want to achieve a decent and plain look. Notice that unlike the previous examples of funeral notices, this one contains the name of the surviving family. This gives you a hint that when you create a funeral notice, you may also include your name, as well any other names of the relatives of the departed loved one, especially those that are directly related to the deceased. 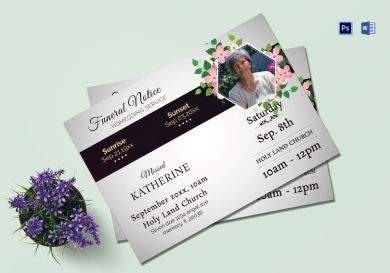 So, after carefully examining all the templates and examples, we do hope that you have gained an idea on how to create a funeral notice, especially with the use of templates, which you can easily customize and personalize.